When I moved to Bushwick from Los Angeles, I knew this scene was a force to be reckoned with. I mean, the amount of facial hair alone is pretty intimidating... It has taken me just about a year to navigate this 'hood true LA Chola style-drunk and disorderly with my music blasting!' I checked out this show last week at Glasslands gallery in Williamsburg. I have been to this spot over 20 times since moving. I am that girl in the shadows sipping on Vodka head-bopping. I have put in my time, and $1, 000s of bucks at the bar. The line up for that Tuesday was of a hodgepodge of local bands and visitors. I did a solid walk around the room to throw my vibe out, and hit the bar. Hard. I just didn't know what to expect, and was by myself. With no band, no friends, I feel like it's no Dice unless I am sucking down at least 4 Vodka Tonics. Plus a sistah' is trying to get holler'd at up in the 'Burg., Wasn't too sauced to see that a little band called Fan-Tan was up first. Bushwick's finest. I had seen them six months ago sandwiched between two horrible bands at a festival. So I made my way to the dancefloor to give them a whirl. Then this song, Window happened. This song filled up the room with this gorgeous sound. Who the hell is Fan-Tan? Where the hell am I? In a movie? Where's my wallet? All of these questions were answered soon enough. Lead singer Ryan Lee's vocals are mixed in with these half distorted, plucky riffs. Bassist Sandee K brings in a bassline bed to hold up Mike Sherburn's banging drums to build up this drama. Drama!! I felt like I was in the movie Sixteen Candles. So much so I was working a total Molly Ringwald look; biting my lip while looking around for Jake Ryan. All I could think was, wow these cats are well oiled and rehearsed. Window is the second single off A Strange Game by Goodnight Records to be released in late January 2013. I want this album! They also played Chapter which was so unbelievably charged with intensity. The first sound you hear from Chapter is the lead guitar just pounding his strings. This song changed the mood not just in me, but the room. People were paying attention. 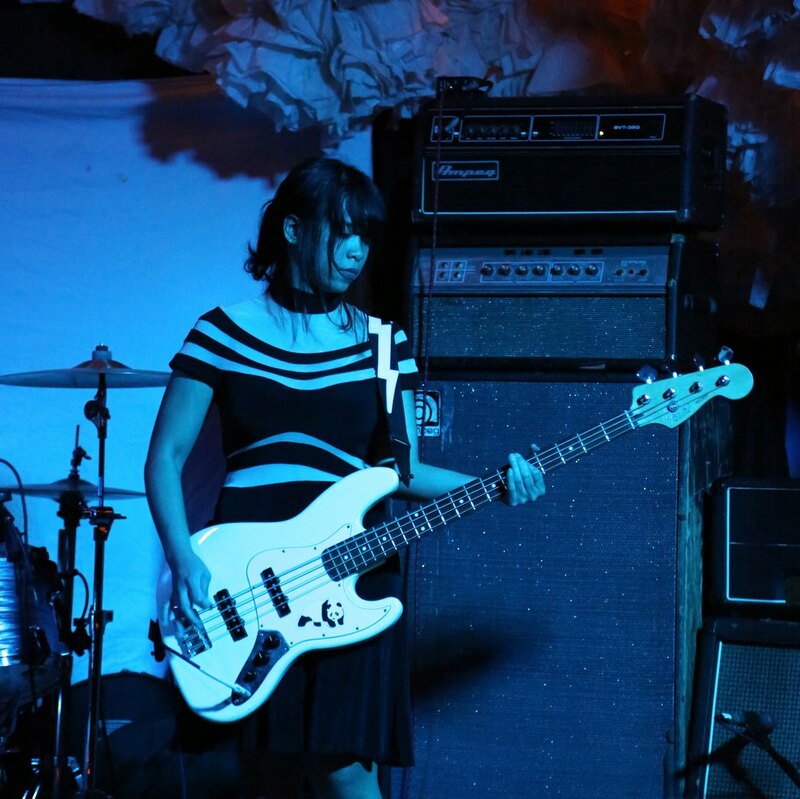 And really they should; Fan-Tan is not a "Shoe Gaze" band other than the fact they use a lot pedals. Fan-Tan bassist Sandee K performing "Chapter", single off their upcoming EP "A Strange Game" released on Goodnight RecordsTheir set was pretty diverse, danceable, and emotional. 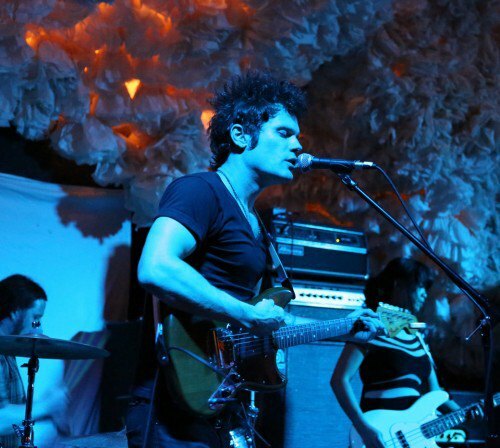 I can see this band playing at Hotel Cafe, early slot at Coachella side stage, or on rotation at KCRW or KROQ in LA. The music stalker that I am hassled the bassist Sandee about the songs I didn't know. She said there was a new song tentatively titled "Crease." This is what I like about professional bands. Even with an album coming out, they are still creating. Yeah, this band is definitely part of my life soundtrack. So here is the setlist: Mimpi, Window, Chapter, 1989, Everything Will Be Fine, Crease, In Waves. Catch them during CMJ at the Gutter on Thursday and MuchMore's tonight. 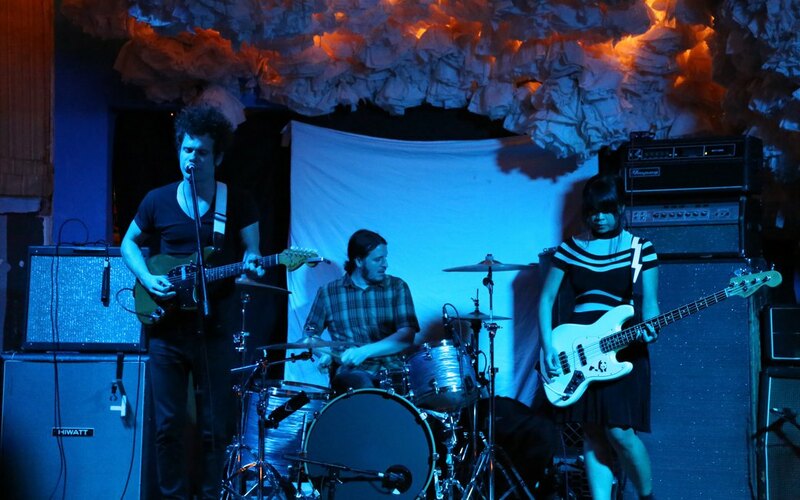 Fan-Tan performing at Glasslands. Pictured (left)Ryan Lee, (center) Michael Sherburn, (right) Sandee KI tried to stick it out for Grandfather and Heliotropes since I am such a chick band lover, but the booze did me in. I am catching them during CMJ. For sure my girls Imma get low at your show! I am saying it now too, these bands are ready for the next level. You might want to get in on them now. I am glad to have seen them in my home away from home Glasslands. I should get my mail delivered here. Definitely putting this place on my Parole Officer's list of places to find me if I skip bail. He will understand. Feel me? Find me.